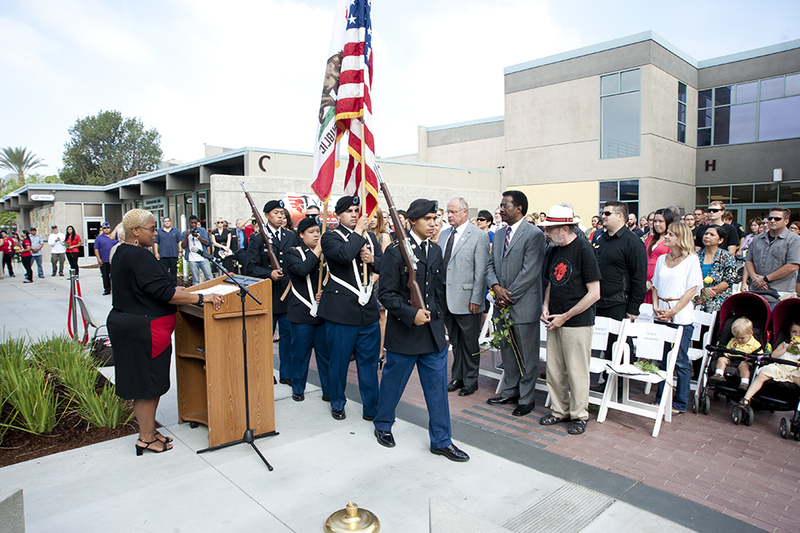 A scene from the 2012 grand opening of California State University, Northridge's Veterans Resource Center, where members of the UCLA and CSUN Army ROTC posted the colors. The VRC is celebrating its fifth anniversary. Photo by Lee Choo. 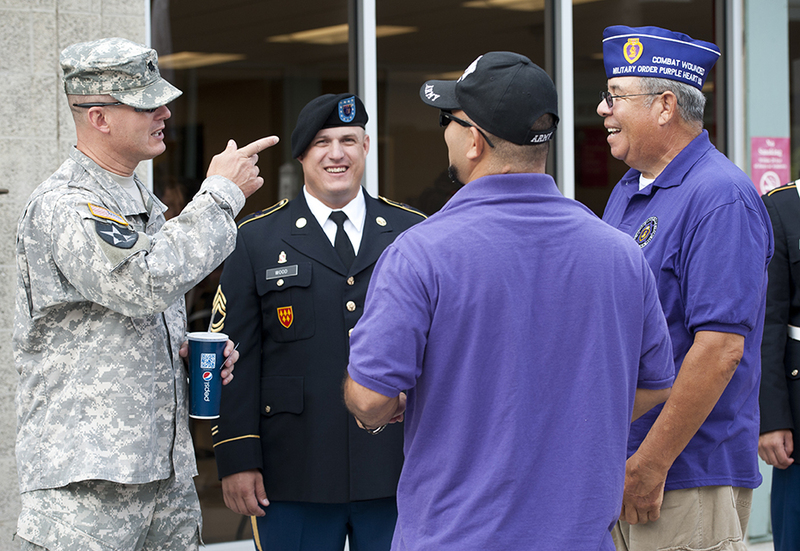 A scene from the 2012 grand opening of California State University, Northridge's Veterans Resource Center, which is celebrating its fifth anniversary. Photo by Lee Choo. 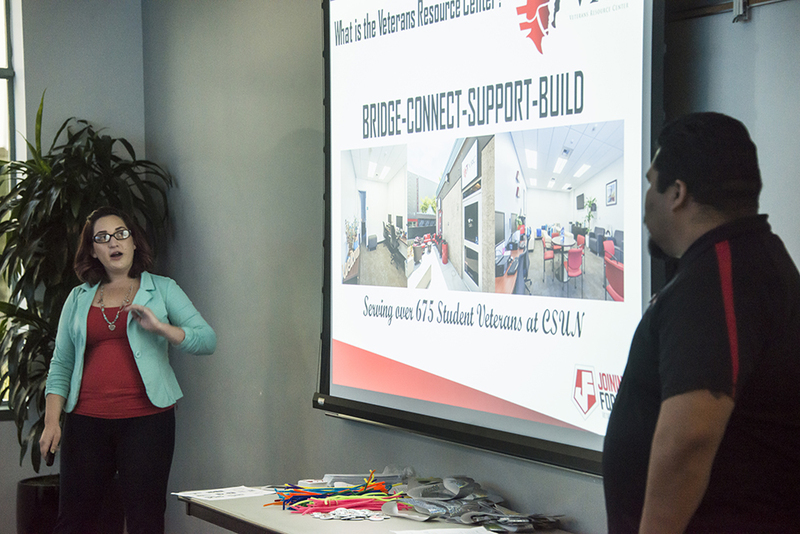 The CSUN Veterans Resource Center leads Joining Forces - Veteran Ally Training workshops aimed at helping students, faculty and staff better understand and connect to the student veteran community. Photo by David J. Hawkins. When medical issues forced Sarah Rivera to leave the Air Force, she felt like she’d lost her family. The onset of an autoimmune disease in 2016 spelled the end of Rivera’s career at McConnell Air Force Base, Kansas, where she worked as an aviation resource manager. In that role since 2014, Rivera made sure pilots, air crew members and other personnel were up to date on their qualifications before missions. After her medical separation, she was suddenly forced to come to terms with the reality that she was no longer part of a military family where every person worked as one to defend the nation. She enrolled in CSUN in 2016. 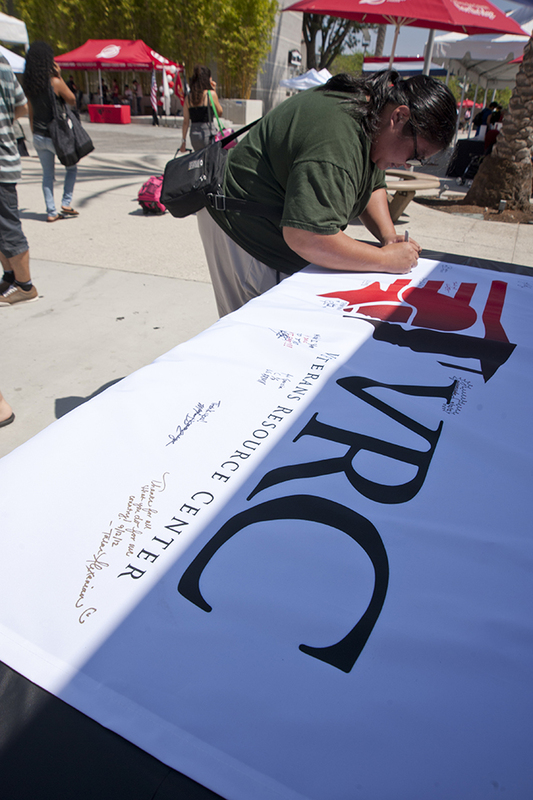 After a disorienting couple of months, Rivera discovered the place that made the campus feel like home: The Veterans Resource Center (VRC), which recently celebrated its fifth anniversary — just in time for Veterans Day. The VRC, part of the University Student Union at CSUN, is a place where veterans can find a community of people who understand, no matter the military branch — whether they were on active duty or are currently serving in the National Guard or the Reserves. Two full-time staff members and a dedicated team of student assistants provide veterans academic, personal, professional and educational services. They help connect veterans with critical resources, including personal, professional and academic counseling, mental health services, emergency financial assistance, and other assistance that boosts the chances of success at CSUN. The University Student Union opened the VRC in 2012 as a student-initiated peer mentorship program, where more established veteran students shared their experiences and tips with new student veterans. It has since evolved into a community, a safe space for individuals whose life experiences and academic challenges differ from those of traditional college students and most civilians. When the VRC opened , an average of 18 students visited per day. That number has risen to about 68, Croisdale said. 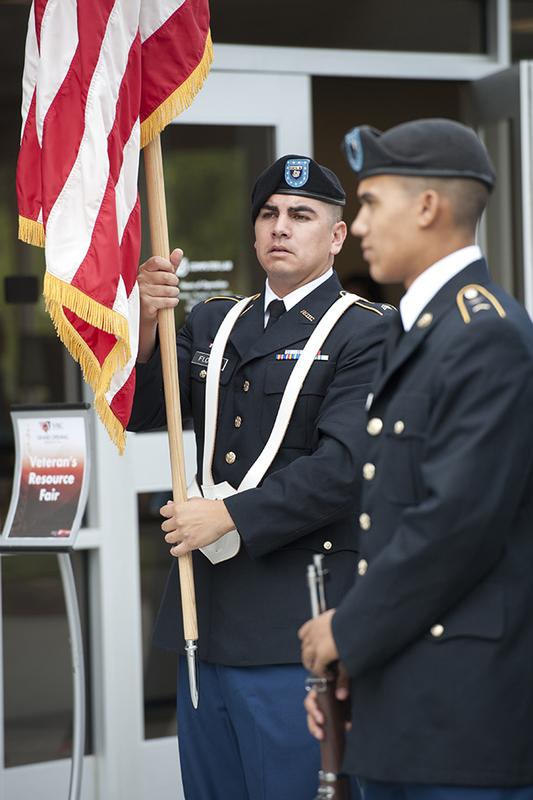 CSUN’s student population currently includes about 700 veterans, as well as at least 450 military dependents (children or spouses of veterans). Although most student veterans enlisted in the years after Sept. 11, CSUN has served veterans of all wars, including a recent graduate who served during the Korean War. In 2016, the VRC began a program called Joining Forces, which provides training to create “veteran allies” among faculty, staff and other campus leaders. The idea is to introduce influencers to the challenges faced by veteran students. For example, National Guard members can be activated and called away for emergencies such as wildfires, and reservists must balance schoolwork with drill activities. Although the current CSUN veteran population skews young, they still tend to be older than students who enroll right after high school, and often have responsibilities such as families, jobs and mortgages. Those who have been on active duty — especially service members who’ve been on combat deployments — have a perspective that most civilians don’t. The VRC helped create a partnership with CSUN’s University Counseling Services and the U.S. Department of Veterans Affairs Vet Center program, bringing two Vet Center counselors to campus to provide mental health services eight hours per week. The primary focus is students with combat experience, and those who have experienced military sexual trauma. Veterans can receive unlimited, free counseling through the program. CSUN and Cal Poly Pomona are the only two schools in the CSU system with such a program. Through the VRC, CSUN veterans and military dependents also can receive professional mentorship, participate in social gatherings and even receive emergency financial assistance. Perhaps most important, the VRC has provided a community for students like Jon Eady, a transfer student in CSUN’s College of Engineering and Computer Science. As an Army National Guard specialist, Eady served as a field artillery radar operator. Without the VRC, Eady said, he might have felt a lack of connection on campus.